What is a Maryland Last Will and Testament? 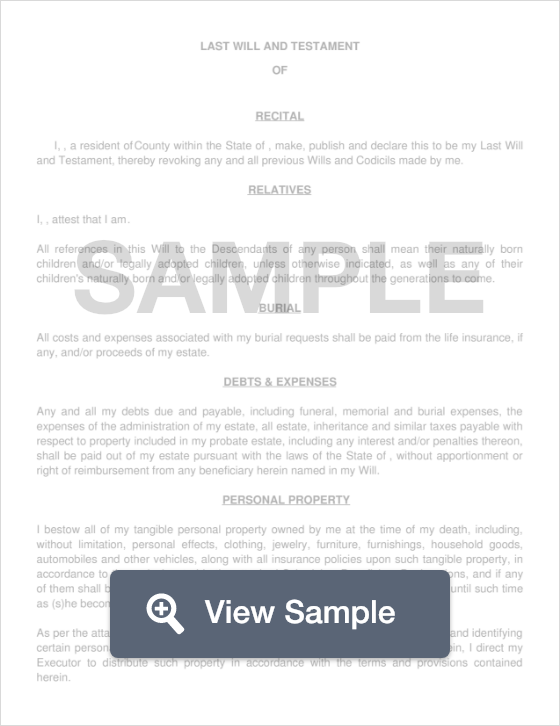 Maryland Last Will and Testament: What Is It? A Last Will and Testament is a legal document that a person, known as a Testator, will create to specify how their personal and real property will be distributed after their death. Once the form is created, it must be signed, witnessed, and notarized to become a legally enforceable document. Once the proper steps have been taken, the Will should be sent to all of the named beneficiaries as well as the Grantor’s attorney. In Maryland, a Will must be registered with the state. Witnesses - According to §4-102, the Will must be signed by two (2) witnesses in the presence of the Testator. Proof of Execution Form (Form RW1102) - Must be submitted with every Will. The Will must be registered, and a $5 fee must be paid. Step 2 - Naming a Spouse - Provide the following information on your marital status, as well as if your spouse will be named as a beneficiary. Step 5 - Establishing Trust for Persons who need Special Care - Establishing a Trust for those who may have a mental illness or physical disability and requires special care, can prevent any issues with them receiving other benefits such as Supplemental Security Income or Medicaid. Step 10 - Name a Trustee - If your assets are set up in a trust, appoint someone to act as your Trustee, one who will be responsible for distributing your assets out of the trust. Step 11 - Name your Digital Executioner - Name the person responsible for distributing your digital assets. Step 12 - Guardian for Minor Children - If you have minor children, provide the name of the person you wish to act as a guardian over them. Step 13 - Naming Additional Beneficiaries - If there are more individuals besides your children that you wish to name, provide that information here. Remember that in the state of Maryland, your Will must be signed by your two witnesses. In addition, your Will must be submitted to the state, along with your Proof of Execution Form (Form RW1102).